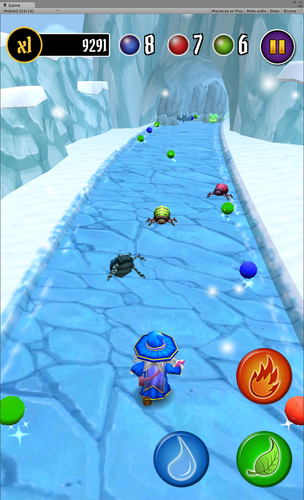 Elemental Rush is a mobile infinite runner, where you can not only avoid obstacles, but use elemental spells to destroy them and fight enemies in his way. You'll have to use the correct elemental power to defeat each enemy while rush to catch the despicable dark wizard who stole your portal make grimoire. You have to chase the dark wizard before he brings the world to the brim of destruction! 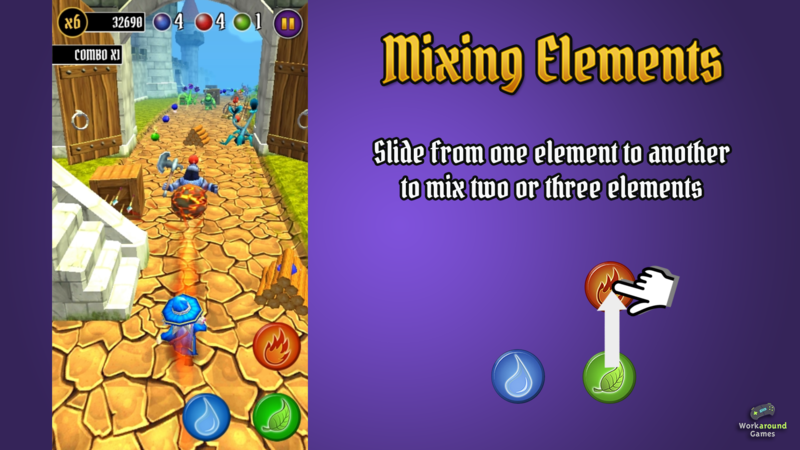 Enemies will be spawned with different elemental properties, you have to use the correct element to defeat them! 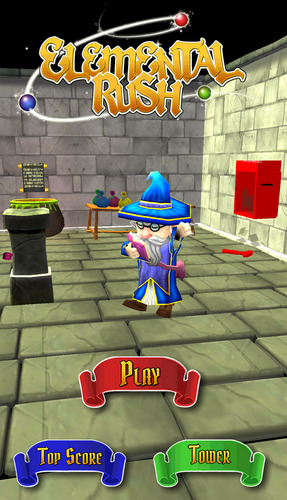 You can also combine the elements to create powerful spells to destroy the enemies and obstacles in your path. You will be able to find and collect power ups that will help you in your quest to recover the portal maker grimoire from the hands of the Dark Wizard. These power ups can boost you elemental spells, summon indestructible golems and more, adding even more dynamics to the gameplay. 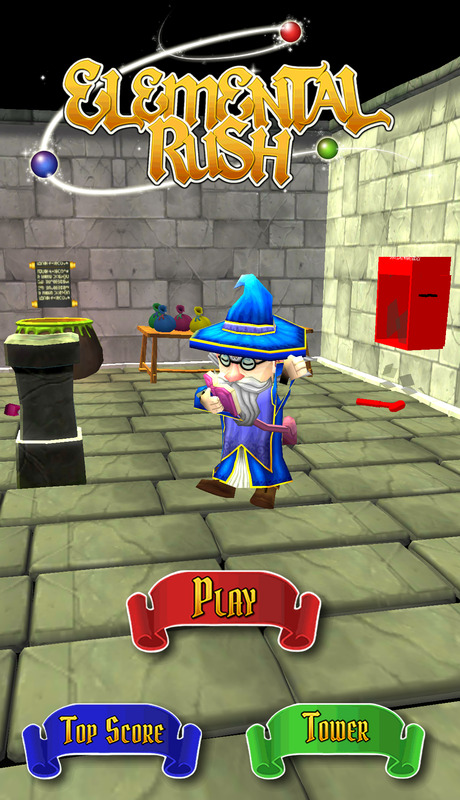 The mage is old like my gran, so he is not strong enough to jump over obstacles. In order to use your spells you'll have to collect elemental orbs that will fuel your mage's elemental powers. Choose wisely how to use your orbs is also part of the challenge. You have to dash through the dangers, choosing when to use your stronger powers. During the gameplay you will find portals made by the fleeing Dark Wizard while he runs to his temple. The portals will take you into a variety of scenarios, presenting you to different creatures with their own behavior. Your score will grow as you endure in the run, and a multiplier will increase the amount of points you get. Destroying obstacles and enemies in your way will increase your multiplier for that run. Using your orbs wisely to destroy as much obstacles as you can increase greatly your score, without running out of powers to keep going on your quest. 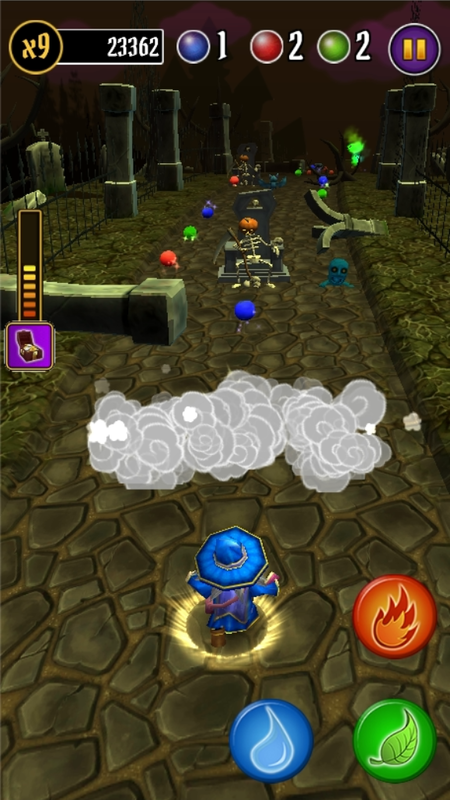 The orbs you collect in each run are accounted and can be used to make your spells more powerful and to increase the effects of your power ups to help you endure even more and get a higher score to best your limits. You will compete for points against your friends and against the world in a interesting ranking. If you like challenges you'll just love it. Rush to get the first place in the ranking. Try to be the best runner. Because you don't need to use a jetpack to be the best, you only need to use your skills in this joyride. You use spells as your blades. Brim back your grimoire to your subway lab.